Experience Historic Jerusalem Up Close! 1BR Luxury Jerusalem vacation rental in historic and pastoral neighborhood down the street from the restored Ottoman train station (http://www.firststation.co.il/en/) at the meeting point of German Colony/Baka/Abu Tor. Ground floor apartment faces beautiful park of carob trees. Historic Monastery and Old City views are only steps away. 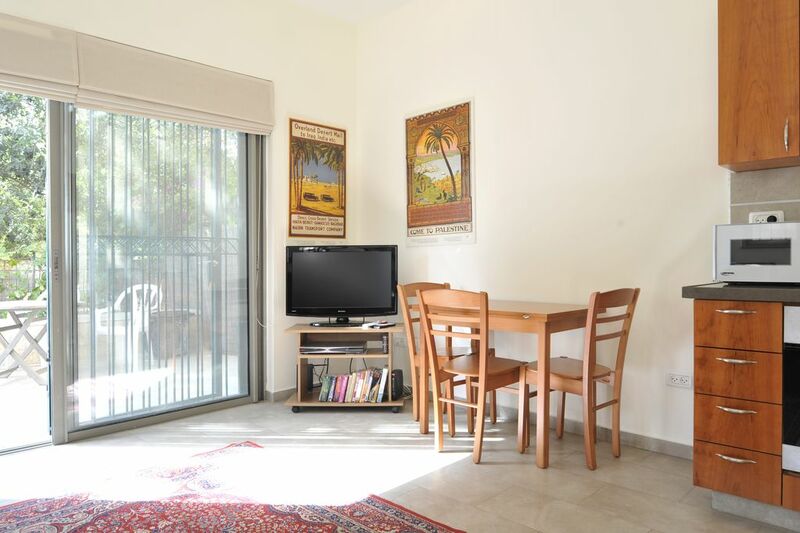 Centrally located in the heart of Jerusalem, close to major sites, shopping and excellent dining, the apartment is part of a luxury apartment building and has a private entrance with a 50 meter delightful private patio overlooking the park. It is lees than a five minute walk to Yes Planet, supermarkets, cafes, restaurants, theaters, the First Station complex, and the Jerusalem Cinemateque. Emek Refaim, the German Colony, and Derech Beit Lechem (cafes, shopping) are a ten minute walk. And the Old City, King David Hotel are just a fifteen minute walk from the apartment. The apartment includes custom tiles and wood cabinetry and a fully-equipped kitchen, washer/dryer, A/C, heat, 32 inch flat screen TV, and wireless internet. Plenty of free on street parking is available in front of the unit. The apartment is non-smoking and no pets please. Enjoying Life in the Holy Land. Located in the Heart of Jerusalem and minutes away from the Old City. Enjoy scenic views of the Temple Mount and the Judean Hills. 3000 years of history are all around. Perfect location. Clean and comfortable. Will definitely return. Great property in a great location. Walking distance to everything: Old City, central city. The condo is great with large exterior private patio with access onto a park. Jordan and Anne will go the extra mile to make sure you are comfortable with your stay. The location was excellent, and the parking was ideal, the facility also was good. A bit inconvenient for three people because of the bathroom located off the bedroom. My main complaint and suggestion to Anne is to replace the tattered bedding and towels provided. They are old, faded, and not what I expected for the price paid for this accommodation. Also to have access to the bedding one must raise the whole mattress and wood frame of the bed to reach the articles stored in the area under the bed. I could not lift it myself, fortunately my nephew was with me and was able to discover this hidden area and lift the bed so we could gather the bedding needed for the living room couch. On arrival the apt. was fair as far as cleanliness, the window sills were covered with dust and cob webs in the corners of the rooms. The patio was strewn with dead leaves which was not a pleasant sight on arrival. I would stay here again and would recommend it to others with the assurance that the bedding and towels are new and fresh and the rooms are fresh and cleaned. We did pay a cleaning fee and it would be worth it if the rooms and patio were sparkling on arrival. I have stayed in many different locations in Jerusalem, I would rate this good for location and parking and average for comfort, cleanliness, and price. Linens have been replaced. Cleaning procedures have been updated. This is very convenient to walk to the Old City and other places around Jerusalem. The bus is not far away and there is a grocery store and restaurants (although expensive) close by. It had the basic things like dish soap, clothes soap, etc... which was appreciated. The apartment was adequate for 2 people..I could not imagine having 4. The only thing it could use is a coffee pot or French press. It could also have used a better cleaning..the carport in the middle of the room was full of dirt and the fridge had not been wiped down inside. We had a great time exploring Jerusalem from this nice clean apartment. 20 mins walk from Old City, and good grocery store nearby. Parking for our rental car was important because parking is not easy close to the Old City. The bathroom is off the bedroom which is good to know if you have someone sleeping on the pullout in the living room. The host was away but the friend he had meet us was very helpful. I would definitely stay there again. This was a perfect little space for us. The owners were helpful and eager to give us tips about what to see in the area and further away. Taking the bus from a few blocks away worked great and the parking outside the unit was also nice when we had our rental car. The cute shopping/restaurant area close by was convenient for getting a meal easily and fun to walk around. This was just right! Minimum three night stay. Rates are for two adults and two children 12 and under. $25/per night for third adult.